The Hematology Oncology Fellowship at Montefiore Medical Center and Albert Einstein College of Medicine provides comprehensive training in clinical practice, clinical investigation, and laboratory science. Established in 1959, our three and four-year programs offer an exceptional range of experience and research opportunities to fully prepare physicians for academic and clinical practice in hematology/oncology. Our ACGME accredited fellowship program sponsors ten new fellows each year and includes rotations at Montefiore Medical Center, and Jacobi Medical Center. 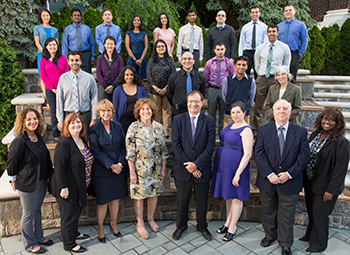 Under the guidance of a staff of 48 hematology and oncology faculty members, including clinicians, scientists, and research scientists, fellows receive a thorough education in benign and malignant hematology, oncology, immunology and bone marrow transplantation. Fellows are responsible for consultations and ongoing care of inpatients and outpatients. Because we serve a population of more than 1.6 million residents in the New York Metropolitan area, fellows are exposed to diverse cultures and a broad spectrum of hematologic and oncologic disorders. Our fellows consider multi-tiered diagnoses, ranging from various rare carcinomas to sickle cell disease. Fellows perform various types of hematopoietic stem cell transplants; perform oncological gynecologic consults, hematological obstetric evaluations and see solid tumor and oncologic/hematologic solid organ/ hematopoietic stem transplant related complications. The fellowship experience is constructed with a stronger emphasis on clinical hematology and oncology research than that of many other institutions. Working closely with one of our clinical investigators, fellows receive formal instruction on creating, executing, and interpreting clinical trials pertaining to thrombosis, hemoglobinopathy, hematological malignancies, Hematopoetic stem cells, and phase 1 studies, breast, gastrointestinal, genitourinary and lung malignancies. Numerous unique educational and research opportunities are available to fellows, such as participating in twice a month research conferences as well as disease specific tumor boards. Tumor Boards consisting of specialists from Surgery, Medical Oncology, Medical Specialties including interventional pulmonologist, and gastroenterologist, Radiation Oncology, Radiology and Pathology form the centerpiece of the oncology-teaching program, as they evaluate and discuss patients for whom a multidisciplinary approach is being considered. A formal curriculum dealing with ethical, medicolegal, and socioeconomic issues is also integrated into the program.